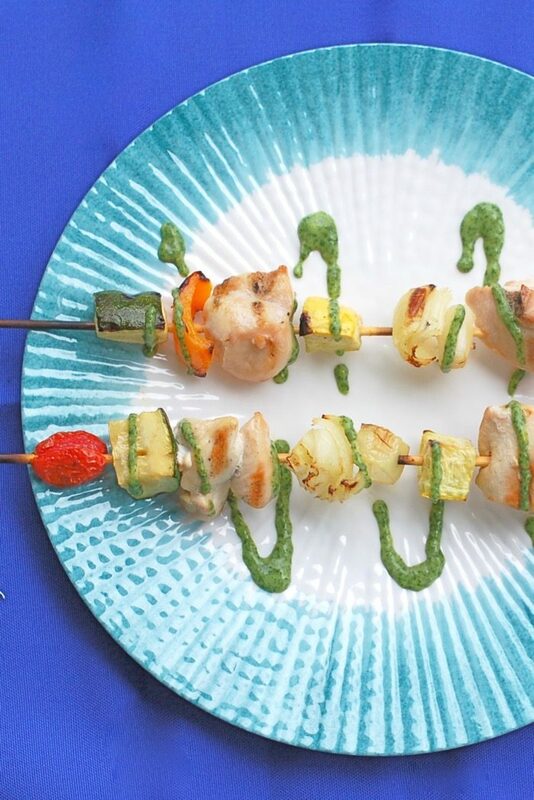 Veggie and protein-packed, these chicken kebabs with herb sauce are the perfect summer dinner on the grill! I was compensated for writing the original article and developing the recipe found in the July 2015 issue of Today’s Dietitian. I was not compensated for sharing the column or magazine with readers on my blog. All opinions are my own. One of my favorite things about summer is the plethora of fresh fruit and vegetables. Everyone talks about zucchini, corn, nectarines, cherries, and heirloom tomatoes, but who can forget the herbs? Most often those fragrant, flavorful little leaves are the showstoppers to an otherwise bland dish. Mint, cilantro, basil, thyme, rosemary — those are just a few of my favorites and you’ll see I use them often in my recipes. While they are available all year long, they reach their peak during the summer. One of these days I’m going to grow an herb garden, but in the meantime, I’ll stick to what’s at the farmers market and local supermarket. Or maybe I’ll snag some of my neighbor’s fresh basil ;-). 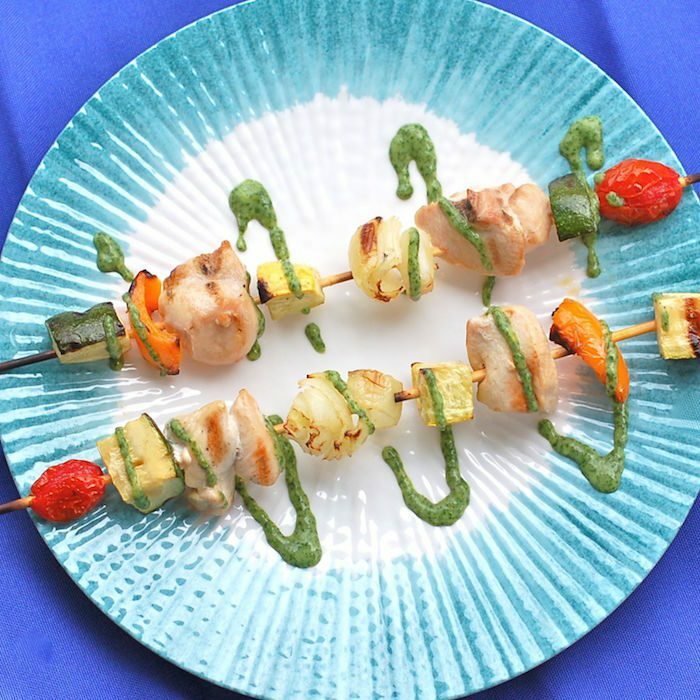 In case you didn’t see the July issue of Today’s Dietitian Magazine, my Culinary Corner column is all about fresh herbs and includes this nutritious and delicious recipe for Summer Chicken Kebabs with Herb Sauce. I used mint and cilantro in this sauce, but if you prefer other herbs feel free to make substitutions. Also, since I keep a Kosher home, I made the herb sauce using dairy-free coconut yogurt, which makes this recipe great for people who have a dairy allergy or intolerance as well. However, feel free to use non-fat or low-fat plain yogurt if dairy is more your thing! Be sure to check out the full article to find out more about how to use my favorite herbs, and of course the rest of the excellent articles in this month’s issue. And don’t miss my Asparagus Mint Salad from the May issue and Caprese Pasta Salad from June’s Today’s Dietitian’s Magazine! Fresh cilantro and mint come together in a cool yogurt-based sauce perfect for hot-off-the-grill chicken kebabs. 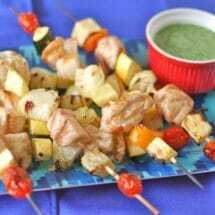 Add zucchini, tomatoes, bell peppers, onions, or any other vegetable of choice to chicken kebabs with herb sauce. Preheat grill at 450-500 degrees. Soak 16 wooden skewers in water for 10 to 20 minutes. Thread each skewer with 2 pieces chicken, 1 tomato, 1 onion wedge, 2 pieces of zucchini, 1 piece of yellow squash, and 1 piece of pepper, alternating vegetables and chicken. Brush vegetables and chicken with olive oil and place on grill. Cook 5-6 minutes; turn over and cook another 6-7 minutes until chicken is cooked through. To make herb sauce, add all sauce ingredients in food processor or blender and blend until smooth. Serve kebabs with herb sauce for dipping or drizzled on top. I just stocked up on a ton o fresh herbs! I love them! Parsley, Dill, Basil, Mint, Cilantro! Yum! can’t wait to see what you do with them! I am loving how fresh that herb sauce is! I want to put in on EVERYTHING, including this chicken! haha…thanks so much Taylor! It definitely would work in so many recipes! I think this herb sauce would be a great topper for a chicken or beef burger too! Or mixed with pasta! Or pretty much on everything I’m craving right now 🙂 delicious recipe and even better picture! What a perfect summer recipe! That was my favorite print magazine – glad to see they are still online! Thanks so much Alisa! Hope you saw my note that they can be made dairy-free with non-dairy yogurt! Great article! I just read it and love how your broke the herbs down! I have to admit, as great as mint is, I only like it in gum hah! But, I do love the basil and rosemary! My all time favorite herb is cilantro, I could use that on everything! Hope you have a great weekend! I LOVE Kebabs! These look amazing and I love the use of local in season produce!! Thanks for sharing this recipe, Jessica. It looks delicious!! Yay! Yes, it’s a great activity for the kids, especially for the veggies. I personally get nervous with them touching chicken, lol! LOL! I know the feeling. I have magazines piling up from months ago. Thanks so much Rebecca – hope you give them a try! That herb sauce looks awesomeeeee! I want these kebabs in my life! Thanks Farrah! It’s so easy – you have to make it! My favorite thing about kebabs, besides food being fun on a stick, is everyone can make their own favorite combo! My kids would love these and I can easily tweak it to make it vegetarian for me. Thanks! Absolutely! You can do veggies only or add tofu – would be so yummy! Oooh that herb sauce sounds so amazing! It’s quite delish. Thanks Emily! They are! Good luck with your herb garden. I hope to start one myself one day! Yum! These look so delicious, perfect for a warm Summer Night too. The Herb Sauce sounds amazing!!! Thanks Angela! Definitely a perfect summer evening meal. I am loving the look of that herb sauce! Such a beautiful pop of colour! that herb sauce looks delightful. Thanks Dixya! LMK if you try it! I am so not ready for summer grilling season to end a I’ll be making these kebabs soon! The herb sauce looks fantastic. Thanks Joanna! Hope you enjoy. Yum! Any meals with a cilantro dressing are my favorite! I love cilantro too, but it can certainly be a divisive herb! So glad you enjoy it! Thanks Brian. Hope you enjoy this one. So awesome you have your own oregano plant – can’t wait to see what you make with it! 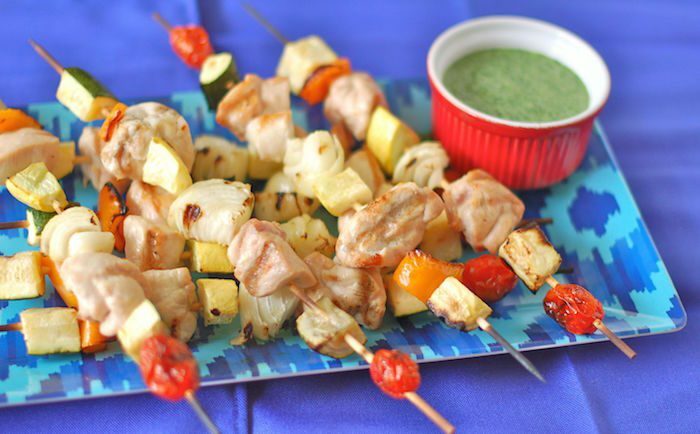 This sounds so flavorful…perfect for summer! Thank you. Hope you enjoy! These kebabs look amazing, especially that vibrant green herb sauce! So exciting for summer grilling! Thanks so much Emily. Enjoy! I always forget about kebabs. Chicken is a staple in our home, so this looks like a great idea for mixing things up. And that sauce looks divine! Hope they’re a hit with your family Alisa. It’s a fun way to change up the standard chicken dish!